LiveCode LessonsGetting Started with LiveCodeGet Up and Running with LiveCode LiveCode PrerequisitesHow do I download and activate LiveCode? 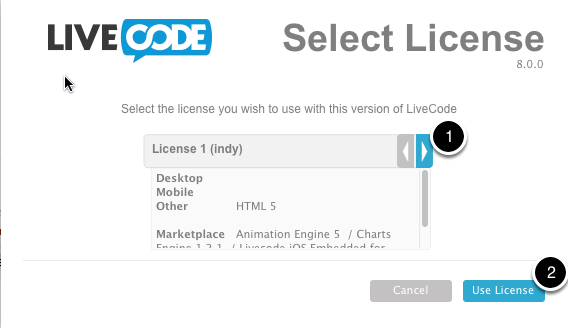 LiveCode does not require a license key. Instead, it is activated by logging in with your user account details, and it checks your entitlement on the server. This is a more secure method of activation, and also prevents many issues with lost license keys and not being sure which one to enter. Here is how it is done. First ensure the computer you are licensing from is online. If you can't do this online, you need to use the manual activation file. If you already have LiveCode downloaded you can skip the first 2 steps. Go to the top right corner of any page on http://www.livecode.com and click on "Login" (1) to log in with your email address (2) and password (3). Click Login (4). If you don't know your password, click on the "Forgot your password" link (5) to have it resent. Note that it will only be resent to the email address you registered with. In your account, if you have an Indy or Business license, you will see download buttons below your license details. Select the version you want to download from the drop-down menu (1), then click the appropriate button to download for your platform (2). If you have a 10 day trial of LiveCode your account screen will look like this. Just select the platform you want to download for from the buttons at the bottom of the screen. Install your downloaded LiveCode. When it has installed you will be presented with an activation screen. It will be on the "Automatic" tab by default, and unless you are offline or behind a firewall you should use this tab. Enter the same account details as you logged in to your account with, your email address (1), your password (2) and click Activate (3). If you have more than one valid license in your account, it will prompt you to select your license. You can scroll across (1) to find the license you want to use, then click on Use License (2). That's it! Your LiveCode will now be licensed. You only have to do this once, the next time you start up LiveCode it will still be activated, and you do not need to be online to use it. I am having some difficulty in installing the LiveCode program on a machine that is not online. I am currently using a public access internet facility for my web surfing, so I would like to install the system manually, I can not appear to get past the first screen of the installer. Is there any way to install manually onto a machine that is not online? I have tried the "Manual" installation options to no avail. you can download a LiveCode off-line activation files and use that to activate LiveCode manually. Follow the link: "Generate LiveCode offline activation file" that is accessible from your account. You would see that link if you scrolled to the top of the page that is shown under step: "Download LiveCode 4.5". Once you have that file, you can use the manual activation steps to activation your instance of LiveCode. I've been using the trial version for a some days. I've now purchased the full version and downloaded it. After installing it and starting the new version, I still get the message, "x days left." What to do? 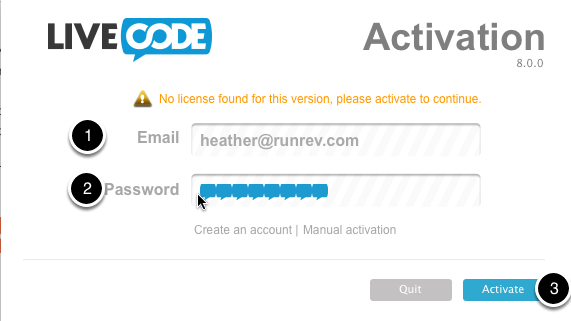 In order for LiveCode to detect up your newly purchased license, you need to re-activate. The link to the lesson below should help you out. I've downloaded the trial version as I want to study before I purshase. I also downloaded the Java files needed and the Android SDK since I want to learn to develop for the Android. When I'm in the IDE and I go to Preferences >>> General Tab, there is a place to enter the path of the Android SDK. I can't find it. I installed the SDK and I have looked in all of the 4,789 folders it in turn installed.. :-) but to no avail. Anyway, I can't debug I guess for Android unless I have this path. Can you point me in the right direction? I can't seem to find any info on how many machines one license works on. What I mean is: I have a Mac at home and a Windows-machine at work. I'd like to work on both machines, but obviously only one at a time, mainly to test how stuff works on the different platforms. Is it possible to activate on both machines, or do I have to activate and deactivate as I move between the machines? you can activate LiveCode on both machines. There is no need to activate and deactivate when you move between machines. Just started using version 5.5.x and it appears that when you start the program that the IDE overlays the desktop showing all of the icons below it. Seems to be unusable for me , I have a cluttered desktop. I am not quite sure what you are experiencing. The IDE contains several components that can be moved around the desktop to locations that are most appropriate for you. We're can I go to download LiveCode for windows? Can you put a link in your reply. And is it possible to run the LiveCode on my jailbroken iPad. I would prefer to run it on my iPad because my computer is older than a dinosaur, it's fosol fuel. You will find a login prompt that allows you to log into your account and access the items that belong to you. The development environment of LiveCode does not run on an iPad, so you cannot write LiveCodes software on an iPad. You can us a desktop or laptop device running Windows, OSX or Linux to develop LiveCode. If you want to deploy an application to an iPad, then you will have to develop your LiveCode application on an OSX device. Just downloaded http://www.runrev.com/downloads/livecode/5_5_3/LiveCodeInstaller-5_5_3-Linux.x86 and am curious what I do next there being no documentation to tell me how to install or activate the code. It's not recognized as an executable. Permissions are properly set as is ownership. Dot-slash gets me a "No such file or directory". LiveCode runs on Windows, Mac and Linux. There is an installer for each of the platforms. The one you downloaded is for Linux. In your comment you indicate that you have already followed all the appropriate steps, but I will run through them here again, just to ensure nothing was missed out. That should launch the installer. The installer runs you through the set up process and helps you register your product. If that still does not do the trick, then try running as su. Maybe the permissions you have are not sufficient to start the installer. Thanks for replying, Hanson but notice I did set permission to execute. No, the problem is that LiveCode, or at least the installer, is a 32-bit application and I'm running a 64-bit distribution of Mint. Some, but not all, 32-bit apps need the ia32-libs library in order to run in a 64-bit environment. I guess the LiveCode installer does because I've got LiveCode running now. yes indeed. In order to run LiveCode and the installer on a 64-bit Linux distribution you do need the the 32bit compatibility libraries. Thanks for posting this. I'm trying to install the Community version of Livecode on a Raspberry Pi! but it insists on downloading the MAC version. I assume thjat this is because it detects that I'm not running Windows, nor a Linux on an x86 platform? Is it possible to run Livecode from a Raspberry Pi? sorry, it is currently not possible to download LiveCode to a Raspberry Pi. The LiveCode IDE runs on MacOSX, Windows and Linux. The standalones run on MacOSX, Windows, Linux, Android and iOS. I try to install the Mac version and my Mac says it does not recognize the publisher and it won't let me install the program. Go to System preferences -> General -> Security and Privacy, and under "Allow Applications downloaded from", select "Anywhere". Once you have installed LiveCode, you can revert to the old settings. I have downloaded The Community Installer for Livecode 7.0.5 for Linux64. I am running a 64-bit Ubuntu 14.04. When I try to launch the installer, Ubuntu tells me that there is no application to handle the document type "program". I am stumped. You will need to set the permissions to allow the installer to run and you will need to ensure that the 32 bit compatibility libraries are installed. I hope that helps, if not please let us know.